The beginning of Summer and end of the school year means there is tons of events; graduations, parties, etc... Yesterday, for my prize day I wore a gorgeous RVN dress- here is the tank version. Last week, I attended a family friend's graduation, wearing this Alice and Olivia dress. All of A&O's summer dresses are perfect for summery events. See below for more Alice and Olivia picks! In my last post, I mentioned about experimenting with my hair more. 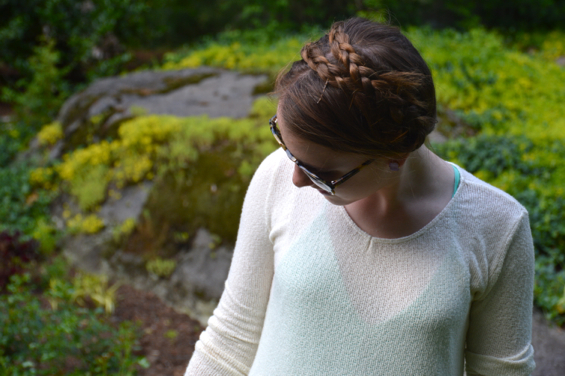 This dutch braid is super easy to do. I am thinking about doing a hair tutorial on a favorite style of mine- let me know if you would like that! Great minds think alike (: Thank you! love this! that green is so your color! Your hair looks so cute! And I love the wedges. Thank you! I am in love with the wedges too- they are so comfy as well!